People with mental illnesses are often placed into a “cage” by the people around them. The words we choose to use and things we say can stigmatize mental illness. It is imperative for us to be more mindful of the effects our words can have. Mental health is not a physically observable illness. We can’t see everything that mental illness affects. This does not make it any less real, important, or difficult than physical ailments. We will never be able to tell what a person is going through on the inside. Unless we take the time to build each other up. Stand with people who need support and have courage to admit when we need support ourselves. This is what can help us begin to break out of our cages and be free to live our lives. For my applied project, I chose to use black out poetry to depict stigma of mental illnesses. 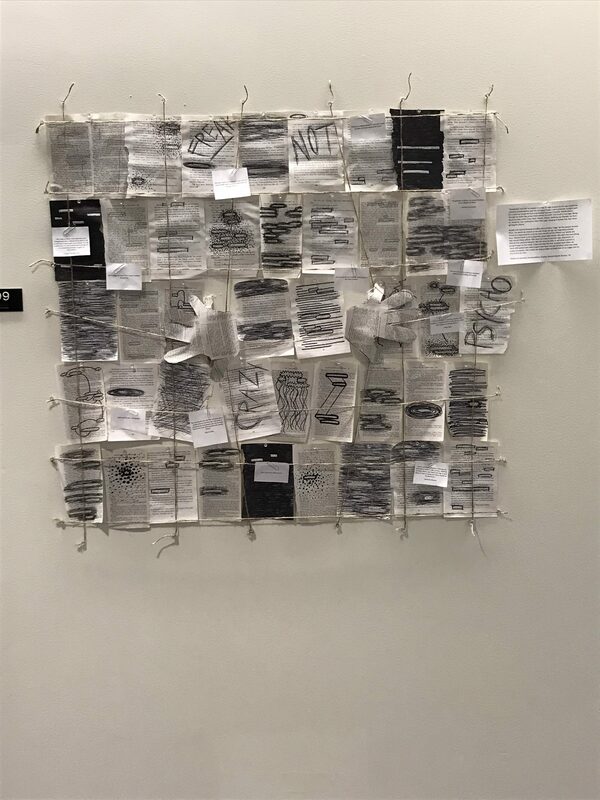 In this piece, I created various poems using pages from One Flew Over the Cuckoo’s Nest by Ken Kesey and Cut by Patricia McCormick, two books with a heavy emphasis on mental illness. I used twine to make a cage like structure over the poems and made hands pulling the cage open. I hoped to create a look of liberation from the negative words and stigma produced by society’s stigmatizing views of mental illness. On the outside of the cage are quotes that explain the importance of mental health and how stigma can reduce a person to a diagnosis. This project was so much fun and very enlightening on the fact that our language is so influential. Often, we have no idea that our words can promote stigma. That’s why I implore you to be more mindful with the words you choose to say!!! Even if you don’t mean to, our words can cut to the bone. Be kind and support the people around you! Here is a video of the process! Please don’t mind my horrible videoing skills! 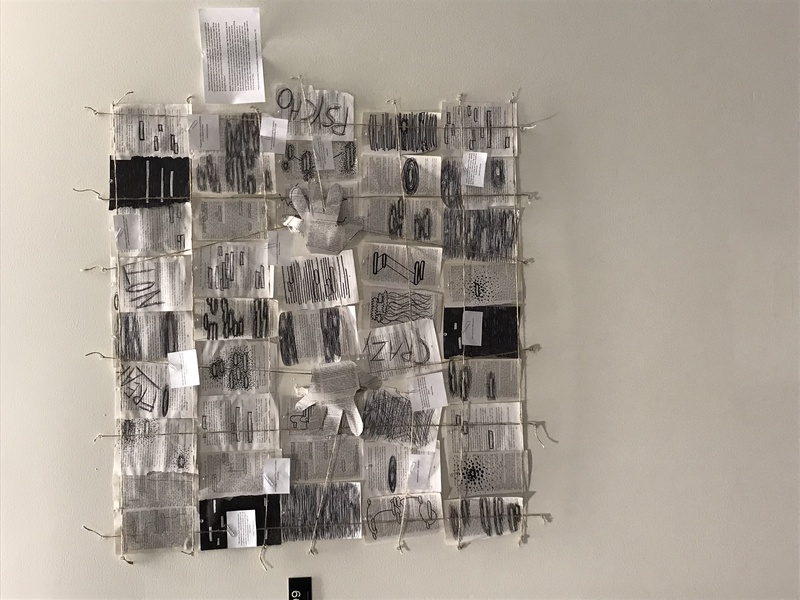 The exhibit can be found in Lamson Library between room 109 and 110! Check it out if you get the chance! Why Should We Care About Drug Use? Drug and substance use has been around since the beginning of time. The beginning of substance use began primarily with alcohol. The first record of alcohol consumption was in 3500 B.C. with the finding of alcohol production being described on an Egyptian papyrus. However, arguably more interesting is the suggestion that Sumerians used opium as early as 5000 B.C. From there, drug use becomes more and more mainstream. Interestingly some of the earliest drug policies aren’t recorded until the 17thcentury in which people are being paid cash to turn in coffee drinkers and the use of tobacco is punishable by death. The evolution of drug use and mindsets towards drug use have evolved so much since the first records of usage and attempts at control. With the development of the world came the emergence of new nations and countries, as well as the continual evolvement of drug use. As America became a new nation conceived in liberty, it also became a nation that had a need for early forms of substance use control. In 1791, the U.S. congress passed the Whiskey Excise Tax; its first policy concerning substance abuse. This act stated that all whiskey stills had to be registered through the government. Some other notable events that occurred were the Narcotic Drug Import and Export Act in 1922, which increased penalties and restrictions on importation and exportation of opium and coca derived products, President Nixon describing drug use as public enemy number one and calling a declaration of war on drug use in 1971, and President Ronald Reagan signing the Anti-Drug Abuse Act into law in 1988. Since that time, drug use has only become a larger problem that our society is forced to deal with; unfortunately, not just our society at that. Every country has or has had issues with substance abuse at some point or another. These issues create a larger need for policies, but policies that are tailored to the people of each country. Policies of one country are likely ineffective or impossible for another country to implement. This results in a multitude of policies that address the same issue through different methods. While some societies would need to adopt radically different policies to see effective results some societies could be similar enough to share best practices. The policies of drug control of the United Kingdom, Canada, and The United States are similar in some respects and different in others, but as a whole the main factors of combating widespread substance abuse are addressed in each one. However, it begs the question of which policy is the most effective or could each policy be combined to make one super policy that works in each of the countries? While there’s no easy way to answer these questions, it’s still important to understand how some of the World’s most dominant forces combat drug abuse. While the United Kingdom has established itself as a forerunner for implementing innovative drug policy, it is still facing a widespread drug use epidemic. 2.7 million people in England and Wales, between the ages of 16 and 65, reported using drugs in 2015-20161. Even more striking is in 2015 the UK saw a 10% increase in deaths from misuse of drugs from the previous year; more than double from the rates recorded in 20121. These increases in death from drug use have lead policy makers in the UK to reevaluate current policies and put forth new and improved measures to combat the rise in deaths. The current policy of the Her Majesty’s Government is still largely based on the Misuse of Drugs Act (MDA) of 19711. The main priority of this act is to create more control over the use and distribution of drugs, to reduce levels of drug misuse14. The act established a three-tiered classification system for drugs; putting them into Class A, B, or C14. Drugs are classified based on the potential harm from misuse of the drug; with maximum penalties established for each of the three classes14. For example, heroin and cocaine, some of the most hazardous drugs are Class A drugs; misuse of these results in the most severe punishments being inflicted14. The current policies still use the classification system established in the MDA. However, policy makers have created a four-pillared plan for fighting drug misuse in the UK. The four pillars established by this strategy are reducing demand for illicit substances, restricting the supply, building recovery, and facilitating greater global action. The first of these pillars focusses on reducing the demand for illicit substances1. To reduce demand, officials are focusing on building resilience and confidence in the youth of the UK in attempts to prevent risk1. At the heart of this strategy is PSHE- high quality Personal, Social, Health, and Economic Education1. PSHE helps to prepare school aged children for modern life, in hopes that they will make positive contributions to society after school1. Restricting supply of illicit substances is the next pillar in the policy. Her Majesty’s Government has expressed that decriminalizing drugs is not their priority, due to the data and research on drugs’ adverse effects on humans1. While domestic drug production rates are slowly rising, the majority of drugs are imported from foreign countries1. This has led to major concern from the government. Measures taking to reduce these rates are increased cooperation with national constituents and building the capacity of countries that import the most drugs into the UK, such as Afghanistan, Pakistan, Nigeria, East Africa, the Caribbean, Peru, and Columbia1. Building the capacity of these countries is concerned with anti-corruption work, improving border checks, and establishing advanced investigation practices and aiding in implementing penalties1. The third pillar of this policy is building recovery from the misuse of drugs. Over the past 10 years, people seeking treatment for opiate addiction has fallen substantially1. This policy aims to provide higher quality treatment options for people and to offer support to local agencies that can provide specific treatment based on the needs of the individual1. Support doesn’t just stop at treatment. Another aim is to provide support after treatment to help the person live a drug free life1. It is also a large concern of Her Majesty’s Government to prevent blood borne infections such as AIDS and Hepatitis C, through clean needle exchange programs1. It also calls for Naloxone to be available in local areas1. Naloxone is a drug that can combat the effects of opiate overdose almost instantly12, making it the forerunner for preventing death from opioid overdose. Treatment for drug users will also be made available at any point in their time in the criminal justice system; whether it be at the police station, in prison, or in the community1. The fourth and final pillar of the UK’s policy on drug misuse is facilitating global action. This aim would incorporate more efficient data collection and work with international organizations such as WHO (World Health Organization) to understand global trends in drug use and establish international controls1. Cross-Border enforcement will be strengthened and engagement with countries that have high levels of importing drugs into the UK will be increased1. Another measure will be policy sharing with other countries and providing the best practices in UK policy to other countries1. The Canadian government’s approach to combatting drug use in their nation takes on a different personality than many other governmental policies. At the center of their strategy lies compassion4. At every level of this strategy compassion and a just perspective can be seen. Clearly the Canadian government emphasizes the importance of a governing body’s support of its citizens regardless of the circumstances. This policy is called the Canadian Drugs and Substance Strategy (CDSS) and was developed in December of 20164. It came as a replacement for the National Anti-Drug Strategy (NADS)4. The NADS went through an evaluative period from 2007-2012, and was implemented until 2016 when the CDSS was developed8. The NADS was primarily focused on youth and their parents as well as those with higher risk of using illicit substances8. With the emergence of the CDSS four guiding principles were established to ensure the highest potential for success. Comprehensiveness, collaboration, compassion, and evidence based justifications are the guiding principles that are encompassed throughout the policy4. This multifaceted strategy covers every point of substance use from prevention, to treatment, to post-treatment support. Prevention makes up a large portion of the CDSS4. Various methods of prevention are outlined, such as identifying and addressing the root causes of substance use4. One strategy of prevention is strengthening protective factors like strengthening relationships within families and providing affordable housing to people who grapple with homelessness, without mandating them to be clean beforehand4. Addressing these risk factors and taking steps to eliminate them are a large concern of the CDSS. Reducing stigma is another main aim of prevention through the CDSS4. Research has found that stigma greatly affects a person’s likelihood to seek treatment and adhere to treatment plans implemented by mental health professionals6. It can also result in reducing access to health care if providers believe a person receiving the care is “drug seeking”4. The main strategy for reducing stigma is to change the way substance use is talked about i.e. the language use when discussing substance use4. It is also concerned with emphasizing person first language, in which the person does not become defined by a diagnosis4. For example, using person first language would be a person with a substance abuse disorder rather than referring to someone as a drug addict. If stigma can be effectively reduced the likelihood of people seeking, receiving, or adhering to treatment plans can increase. Treatment is another important factor addressed in the CDSS4. Improving to comprehensive and evidence based treatment is greatly emphasized4. The main goal of treatment is that it can be tailored to every person’s needs4. It doesn’t just concern getting clean, but staying clean and leading a productive life thereafter. Treatment services include medication to combat substance addiction as well as non-medical treatments and supports that are imperative for successful treatment, such as housing and employment, among other things4. The treatment practices mentioned in the CDSS are all implemented by provincial and territorial governments4. Another interesting point made by the CDSS is that court appointed treatment programs can be offered to non-violent offenders in place of incarceration and should a person become incarcerated, take home naloxone kits are provided upon release to prevent death from overdose after their release4. Harm reduction is one of the main perspectives used in the CDSS4. Harm reduction is mainly concerned with reducing the negative impacts that substance use can have on a person, their family, and the community4. The CDSS takes on a harm reduction approach through different programs that help limit the ramifications of drug use. Needle exchange programs and increased availability of naloxone are a couple examples of harm reduction approaches used4. Another harm reduction approach mentioned in the CDSS is Insite, which is a supervised injection sight for IV drug use. Insite was opened in 2003 and was able to prevent fatal overdoses from heroin2,9. Of 300 overdoses on site in the first year of operation no fatalities occurred2. These harm reduction approaches are focused on defusing adverse effects of drug use first and follow with treatment opportunities for people who need it. The scope of the CDSS does not end with people who are using drugs. It also addresses plans to change perspectives in enforcement from a criminalizing lens to that of a health lens in order to facilitate more compassion when dealing with people who use drugs4. This shift in perspective involves more efficient and effective training for police officers to focus on harm reduction and destigmatizing drug use4. These practices are notably used by the Vancouver police department in which a specific overdose-response protocol has been established and officers only attend an overdose call if there is a death or a risk is posed to public health4. Based on what the Canadian government outlined in the CDSS, it is clear that compassion and safety of the individual are the main concerns of the policy. The policy didn’t just address one factor of drug use, but touched on many importance aspects that are involved in drug use. Addressing these factors allows for an extremely comprehensive policy that covers every angle. The U.S. is currently immersed in an opioid crisis that also calls for a multi-faceted strategy to address the widespread drug abuse. In 2016, 42,000 deaths resulted from opioid overdose, which is 9,000 more deaths than those recorded in 201510. With the death toll on the rise, the U.S.’s opioid crisis has garnered great attention from its citizens and government. In response to the epidemic that is plaguing the American people, the Trump administration has developed a new strategy to combat this crisis. The secretary of the Department of Health and Human Services (HHS) released their course of action which encompassed five strategies to best address the U.S. opioid crisis. These strategies are being implemented in hopes to win the seemingly unwinnable battle with opioid usage in the U.S. The first of these strategies is to improve access to treatment and recovery services7. 90% of U.S. citizens struggling with addiction are not receiving treatment7. This staggering amount of people without access to treatment lead HHS to give $485 million dollars in grants to the states to go towards each state’s evidence-based treatment and prevention programs7. HHS hopes these grants will go towards promoting the best practices of the prevention programs, but allowing the state to dominate what programs receive funding so that treatment or prevention can be tailored to the citizens of each state7. Based on how effectively these grants are used and what best practices can be shared, another $500 million is set to be allotted to state programs7,11. Another attempt at making treatment more accessible to people was made by a policy released by the Center for Medicare and Medicaid Services (CMS)7,11. CMS released a policy that counters a long-standing policy which prevents Medicaid from paying for inpatient services at treatment centers that have a greater capacity than 16 patients (CDC)7,11. This policy allows states to have more expenditure authority to pay for services at specific treatment centers, while the state increases its own treatment capacity (CDC)7,11. Promoting use of overdose reversing drugs is the second strategy outlined in the HHS course of action. The government is hoping to make access to drugs such as naloxone that can reverse the effects of an opioid overdose, more accessible to citizens, meaning more abundance and more affordable7. They also hope to explore the use of new drugs that could reverse the adverse effects of other classes of drugs7. Exploring these drugs can be done using the third in the HHS plan; strengthening understanding of the opioid epidemic through better public health surveillance7. The HHS is committing itself to collecting data as to best understand the trends of opioid use7. Border surveillance and protection is also being increased so that if shipments of drugs to specific cities are intercepted, local authorities can be notified and be on call for any increases in overdoses7. With large waves and increasing numbers of overdoses, the fourth strategy in HHS’s plan becomes even more important. The HHS wants to increase research around drug use, treatment, and prevention7. Research is important for this epidemic because it is a continually growing problem that previous techniques have not been able to staunch. With an increased emphasis on research, federal programs can find more drugs to combat overdose, find more effective treatment strategies, and maybe develop drugs that elicit the same analgesic effect as opioid without the high risk of developing an addiction7. The worst side effect of opioid use is its extremely high risk for developing addiction. Unfortunately, opioids are the most common analgesic drugs used for managing pain. Finding better ways to manage pain without the use of opioids can stop the development of dependence in the first place. HHS has begun to rethink the current strategies for pain management and hope to find better and safer alternatives for managing pain7. Since not many alternatives have been found yet, the FDA released information for prescribers of opioids to educate them more thoroughly on how to identify if opioid use is necessary in a given context11. The FDA is also beginning to require opioid manufacturers to provide more educational material and training to providers11. Among the strategies released by HHS, the Trump administration is launching multimedia campaigns to spread awareness and information on opioid use and its risks11. One such program is the RX Awareness Program5. The CDC launched this program that is helping states fight opioid use by sharing the real stories of people who are recovering from an opioid disorder or who have lost loved ones to opioid use5. The CDC also released a manual for first responders on dealing with fentanyl usage and overdose5. The strategies used by each of the countries discussed may have different emphases, practices, or plans, but their overarching goal remains the same. Substance abuse is a scourge to society and continues to threaten millions of people all over the world daily. As deaths from substance abuse continue to rise, we see a greater need for effective strategies that can end the destruction of widespread drug use. International collaboration will become more and more necessary to this cause and without such collaboration, many countries could be in serious trouble. Drug addiction takes no prisoners. It can affect anyone and everyone and will not discriminate. As people continue to be affected, the use of more innovative strategies and policies will need to be implemented. Addiction has declared war on innocent people who must stand in solidarity to take back our safety that is jeopardized by drug use. 12017 Drug Strategy. (2017). HM Government. Drugs: Education, Prevention and Policy,20(3), 234-240. 4Canada, H. (2018, September 10). Strengthening Canada’s Approach to Substance Use Issues. 8Department of Justice. (2018, September 26). National Anti-Drug Strategy Evaluation. indicators and developments since 2000. International Journal of Drug Policy,27, 23-35. 12Prabhu, A., Abaid, B., Khaleel, M. S., Naik, S., Lippmann, M., & Lippmann, S. (May 2018). The Naloxone Option. The Journal of Family Practice,67(25). for people who use drugs. Canadian Medical Association Journal,190(31). I just read this very interesting article discussing medical marijuana and its connection with reduced opioid use. There is some great information in the full article so if you have the time please check it out! Otherwise, if you’re like me and have 30 seconds of free time to breath and blink then hopefully my post can help you understand this topic a little better. Medical Marijuana: What is it and why should I care? Medical Marijuana is a relatively new industry which explains why most of the dispensaries are in sketchy looking buildings. Nevertheless, there are some great benefits to using medical marijuana. 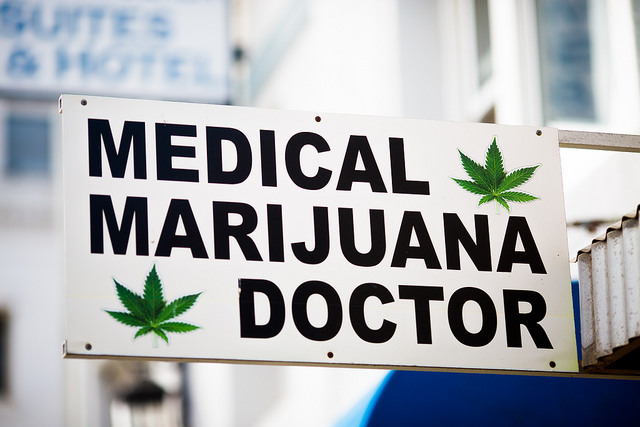 In short, medical marijuana is just marijuana that is used to treat different illnesses or their symptoms. The important components in marijuana are the cannabinoids. The two main cannabinoids we find in marijuana are THC (Tetrahydrocannabinol) and CBD (Cannabidiol). Our endocannabinoid system affects things like pain modulation, appetite, and memory. It also affects various immune system responses and elicits anti-inflammatory effects. Anyway, of the two cannabinoids in marijuana, THC is the only one that elicits the psychedelic effects or gets you “high.” It also can decrease pain and inflammation and help with muscle control problems. CBD can be used for all the same things that THC can but it can also help with epileptic seizures and could even help treat mental illness and addiction. Another interesting thing in this article was the correlation between legalizing marijuana and decreasing prescription opioid problems. The research shows that in states where there are medical marijuana laws and adult-use marijuana laws also had lower rates of prescribing opioids, opioid misuse, and treatment admissions for opioid addiction. We also know there are pain relieving effects from marijuana so that could potentially be influencing opioid prescriptions. Considering this, if we know that medical marijuana can help with things like epilepsy and tremors associated with Parkinson’s why should we start accepting It? 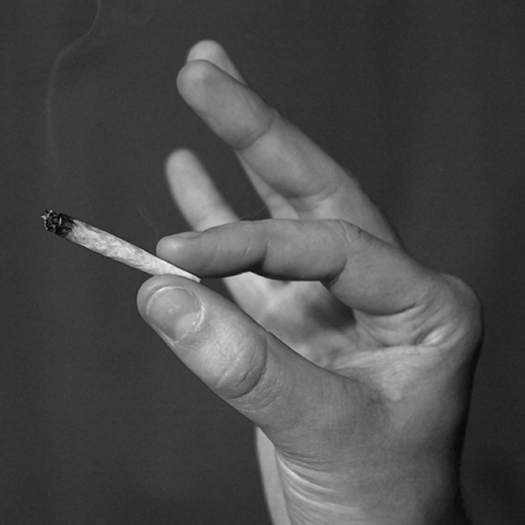 There is a stigma that surrounds marijuana. My older sister was given the suggestion to start using medical marijuana to help with her pain and seizures. However, she refused to even consider it because of the reputation that marijuana gives people. Whatever the case is, I think that the discussion for legalizing marijuana is such a relevant one. Looking at it from a health related standpoint, I think therapeutic use of marijuana is something to explore and could prove to have major benefits.